A new community of 19 townhouses, The Charbonnel will feature architecture by Richard Wengle and interiors by Gluckstein Design. The site, currently in registration, is located in Toronto’s Summerhill neighbourhood, close to De La Salle College, Scaramouche Restaurant and Robertson Davies Park. 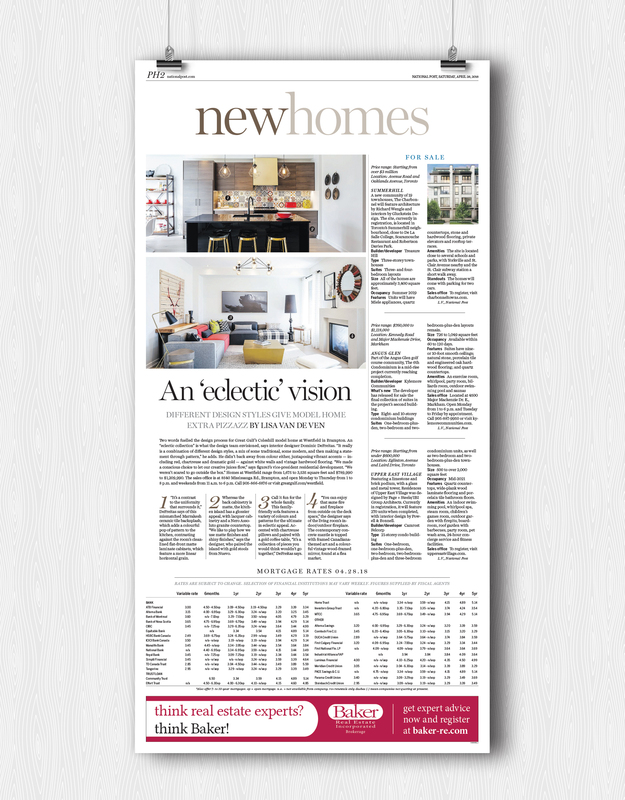 Two words fuelled the design process for Great Gulf’s Coleshill model home at Westfield in Brampton. An “eclectic collection” is what the design team envisioned, says interior designer Dominic DeFreitas. “It really is a combination of different design styles, a mix of some traditional, some modern, and then making a statement through pattern,” he adds. He didn’t back away from colour either, juxtaposing vibrant accents — including red, chartreuse and dramatic gold — against white walls and vintage hardwood flooring. “We made a conscious choice to let our creative juices flow,” says figure3’s vice-president residential development. “We weren’t scared to go outside the box.” Homes at Westfield range from 1,675 to 3,535 square feet and $789,990 to $1,209,990. The sales office is at 8540 Mississauga Rd., Brampton, and open Monday to Thursday from 1 to 8 p.m. and weekends from 11 a.m. to 6 p.m. Call 905-866-6876 or visit greatgulf.com/westfield.